PCI's Certification programs support the entire powder coating marketplace by assessing a company’s capability to produce quality parts. Those who pass the comprehensive audit demonstrate that they can meet a high professional standard in the industry. 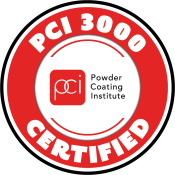 PCI Certification is an extensive audit program that evaluates an applicant’s powder coating processes and procedures, equipment, maintenance practices and quality control capabilities to ensure they have the capability of producing a high-quality powder coated product. The program offers two certification types; PCI 3000 Certification applies to custom coaters and PCI 4000 Certification applies to original equipment manufacturers (OEMs). Qualified, third party evaluation and assessment of capabilities. Provides a basis to create a continuous improvement process for enhancing powder coating operations. Serves as a benchmark against industry standards. Access to the PCI Certified logo to promote certification status and benefit from the image elevation associated with the high standards of certification. Differentiation from other coaters and access to business opportunities requiring PCI Certification. Highlighted on the PCI website and in Powder Coated Tough magazine.